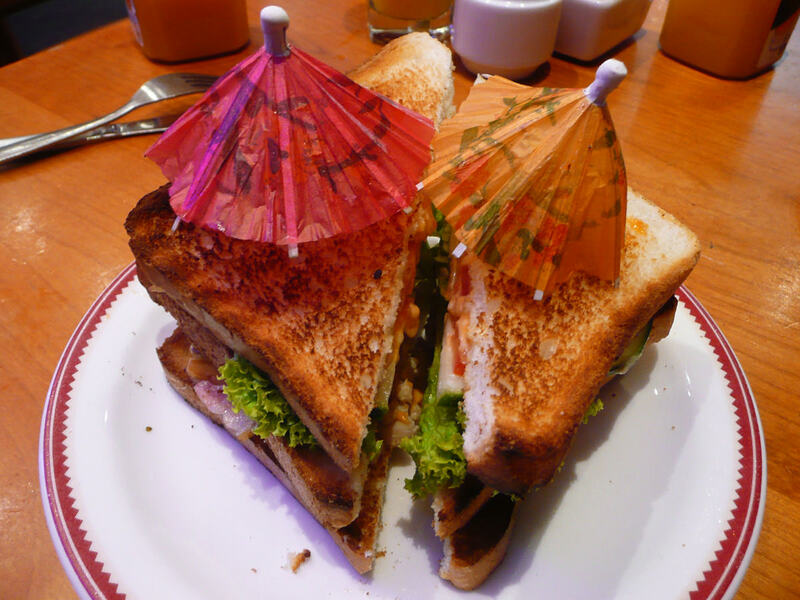 We had breakfast at the Cuckoo Chef cafe, Carousel Shopping Centre, on ANZAC Day morning. Jac ordered the eggs benedict. 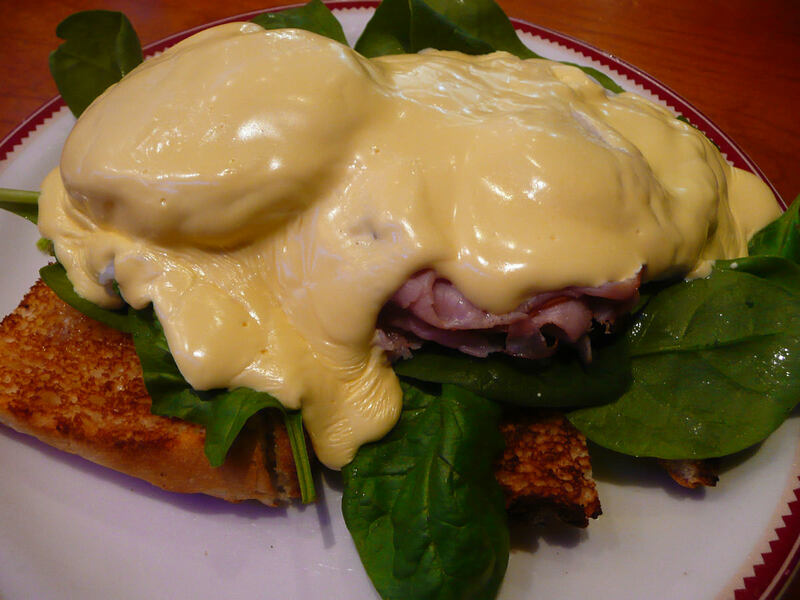 The toasted Turkish bread, ham, poached eggs and spinach were smothered in thick, almost congealed-looking hollandaise sauce (see the creases in the sauce? Ewww, hollandaise skin!). The poached egg yolks weren’t as gooey as Jac would’ve liked, and she thought the hollandaise tasted like the commercially bought kind rather than made from scratch – it was okay overall, but I think I enjoyed my breakfast more than Jac enjoyed hers. 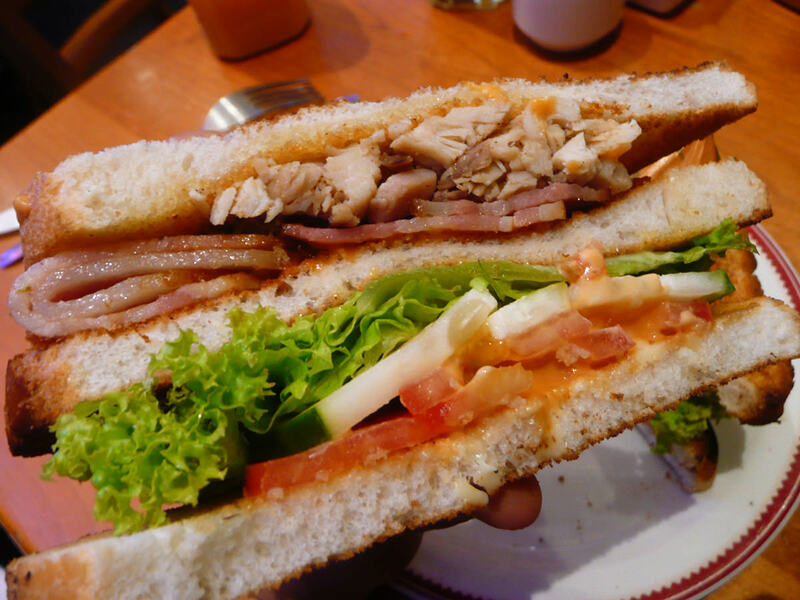 In the sandwich, there was roast chicken, bacon, lettuce, cucumber, tomato and what appeared to be Cajun mayonnaise. It was a very big, messy and ultimately satisfying bite. The bread was toasted quite hard, which made eating the sandwich even more messy (crumbs, crumbs, everywhere!). I cut my palate on a piece of bread that surprised me with its sharpness, but I did enjoy the sandwich. The chicken, bacon and mayo were the best bits. I like club sandwiches. I should eat more of them. Bento lovers, I hear you! I promise, there are bento posts coming soon, complete with bento notes for Jac!